Bird lovers have been urged not to remove any netting left on a cliff face originally put up to prevent sand martins from nesting. North Norfolk District Council has been taking down the material installed along the top of the cliffs at Bacton after talks with the RSPB. 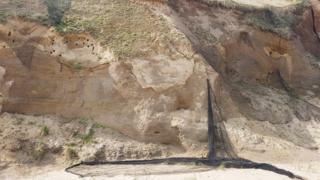 However, it said the nets would remain on the lower levels for a sand-scaping scheme to stop coastal erosion. "Please do not put yourself at risk," a council spokesperson said. In a post on Facebook the council said: "Leaving netting hanging on the cliff bunched and with loose edges is not helping the sand martins despite the sentiment. "We have taken upper sections of the netting down, with advice from the RSPB, and work is continuing throughout the weekend. "Lower levels will remain so sand martins are not disturbed while we work to protect vulnerable local communities." The netting - designed to stop the birds nesting in cliff holes - sparked a public outcry. Bird charity the RSPB feared the sand martins risked "getting stuck" in the nets and dying, while TV naturalist Chris Packham described the measure as an "atrocity". The council said the nets were put up to encourage the birds to breed further along the coast during work on the coastal management project. Work to remove the mesh covering the upper sand cliffs should be finished by the middle of next week depending on the weather conditions, the council said.